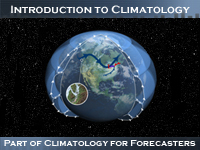 This module provides an overview of climatology, the study of climate. The module begins by examining the drivers that combine to create the climate regions of the world—from those at the mesoscale (local) level to those at the synoptic-scale (continental) and global-scale levels. Examples include locally dominant winds, air masses, fronts, ocean currents, Earth’s rotation around the sun, and latitude. Each discussion of a climate driver has an ‘example/exploration’ segment, where the information is applied to several cities. The module also examines a scheme for classifying the world’s climate zones, the sources and uses of climate information, and some of its limitations. The module is intended for a wide range of users, from forecasters and scientists to those in business and government as well as the general public—in short, anyone interested in learning about climatology. Some familiarity with basic meteorology is useful although not required. A very well designed module and easy to understand especially with the audio explanation. Great learning platform. I was not allowed to see the menu in the lesson which meant I could not continue or even start the learning process. The program should be made to fit any computer screen. I had to take the test based on all the information I learned in class. Its an great and interactive way to learn. Fast paced. I am taking a 100 level course, and have no experience with meteorology. In the beginning, the course states that some experience is recommended but not required. I beg to differ. This was incredibly difficult to grasp everything. I think I was lucky to have passed the Quiz. Select all that apply are not cool. Good experience, helped expand my knowledge on this topic. this is a great program and lessons are well read. This course gave me a much needed refresher on the subject of climatology. as a non climatology student this helped me understand what climatology is about. This is a best lesson fto enhance individuals climate change understanding. It helped me to understand climatology and how to use it. It was a challenging quizz, time consuming and very interesting activity. i found it very time consuming but at last i managed to finish and learned a lot. very direct, simple to understand information. It is more helpful and makes one think deeply. I believe it would be better if it's pure modules and the video is separated. It's kind of disturbing when you're reading and you hear someone speaking it. The lesson that i undertook was very informative. It was also well presented with graphics that complemented the text. I recommend any person that is interested in climatology to give it a go. Informational. Very glad that there's a narrator to the text! There must be a more involved way to teach this stuff. It was my first time to learn Geography related matters at this level and the lesson were very productive in creating both interest and the understanding I needed to complete the quiz. The Session contained great information and broke all the ideas down to make learning the content simple. The questions were a little challenging, even with the information given from the videos. I was fascinated by the whole program. The test is littered with trick questions. Almost all of the "select all that apply" choices could be argued either way and the lesson does a terrible job of telling you which way to expect the test to argue. I had a blast learning about the basics of climatology and this lesson will surely help me in my physical geography midterms and final. it was refreshing yet new. The lesson was very informative and furnished me with crucial climatic information that I wasn't aware of before. The lesson was very useful, it gave me clarity on some of the climatic terminology I wasn't sure of. The lesson was very interesting and useful. It has helped me to improve my understanding in some concept of climatology. Very helpful and informative lesson. Why cant I see my answers? How are we supposed to learn this way? This way of doing homework is great! This is a great tool to be used to further the skill level and understanding for forecasting the weather or on the road to becoming a Meteorologist. Was a very very long process....only because I have terrible internet connection, so other than that the material content is really informative. Had I known a lot of the material was to be loaded for viewing and listening, I would have made other arrangements for a faster internet connection. Next time I'll know. The module explained everything clearly so it was easy to understand the material. Step to step instruction into Climatology. The graphs and examples were great for helping to understand some of the information. I liked how the lesson was presented but there was a lot of information to take in for a new student. hard to navigate... Had to replay the lesson a few times before I finally could get the answers correct and actually understand. This course was pitched at a decent level of difficulty to be informative and challenging enough without being overwhelming. I'd recommend this to those with a basic knowledge of climate who wishes to add to their knowledge. • Define the terms climate and climatology and differentiate them from weather. • Describe the key drivers that determine climate regimes at the global-, synoptic-, and meso-scale levels. • Describe how climate zones are classified and how the classifications can be used to relate similar regimes. • Describe the general uses and limitations of climatological data. Identify climatologic data sources.